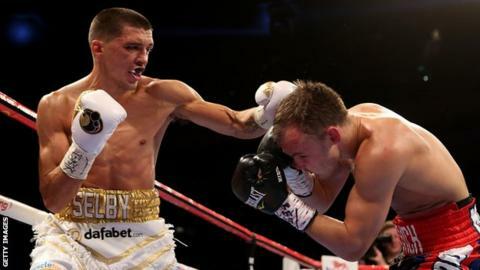 IBF featherweight champion Lee Selby says his first defence will be the start of big things in his career. The 28-year-old Welshman puts his new title on the line against Mexican Fernando Montiel on 14 October. The fight in Glendale, Arizona, will be Selby's first promotion in the United States and a chance to make his mark on the lucrative American market. "I'm really looking forward to making my American debut and it's the start of something massive," Selby said. He has since signed up with boxing great Floyd Mayweather's advisor, Al Haymon, with the aim of fighting in the United States. Assuming Selby, who has lost once in 22 fights, retains his title against his 36-year-old opponent, a domestic defence could be on the cards. Unbeaten Commonwealth featherweight champion Josh Warrington has been vocal in the press calling out for Selby to fight him next. Selby says he would be prepared to face Warrington on the 24-year-old's home turf in Leeds, but warned that the younger man might regret his bravado. "If he keeps going on, he's going to get what he's asking for - he won't be too happy with the result!" added Selby, speaking to Radio Wales Sport. "I'm more than happy to go up to Leeds, defend my title, silence his crowd and knock him out."